The second part of the city bus simulator, which allows driving with MAN buses on route no. 5 in the Spandau district of Berlin. The production boasts an advanced traffic organization system and a realistic reflection of the streets of the German capital. - The articulated bus MAN NG272 with the exact physic and graphic replica of the articulation mechanism and the appropriate sounds and systems (bend damper). - The MAN NL202 together with reworked and completed models of the SD200 and SD202 (more years of manufacture, emergency door opening, destination plates, individual, bus-dependent sound variation. - The Spandau bus route 5 from U-Bahnhof Ruhleben (underground station) to Nervenklinik (mental hospital) with 12 km overall length, many new buildings, tight schedules and dense 5 minute intervals for varied and long-lasting driving experience. - Simulation of the original timetables and vehicle schedules for bus routes 5 and 92. - Chronologic function: Watch Spandau change between the years from 1986 to 1994! 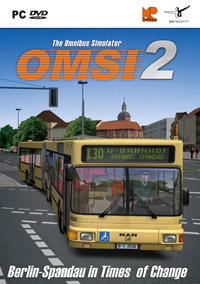 In OMSI 2 you can relive the fascinating time in the early years after the German reunification with its many innovations and extended routes (bus 137 to Falkensee). This function also allows specifying temporary alterations to the maps and routes, like construction sites or special tours. OMSI 2 is based on world coordinates, thus a DEM (Digital Elevation Model) can be imported (a DLL is used for this which can also be programmed individually). - The streets and intersections on the Spandau map follow the real elevation gradient. - New editor functions: automated import of aerial pictures, terrain can be aligned to the road gradient, improved spline connecting algorithm, three-axle rotation of scenery objects. Intersections can easily be fitted with individual gradients. - Memory-saving map loading procedure technically allows for very large maps. Game score 8.7 / 10 calculated out of 366 players' votes.